3 Lord, how they have increased who trouble me! This is a psalm appropriate for Father’s Day. When we read it, it doesn’t seem like it, but it is about a rebellious son and a father too busy and too remote to instruct his children in wisdom. Thus, it contains a lesson for us. Absalom was one of David’s many sons. 2 Samuel 13-18 tells the story of his rebellion. Rebellion is an ugly thing. War is an ugly thing. When people we trust turn against us, we hurt. David hurt. So David was angry with the leaders he had depended upon to advise him and carry out his commands. Yet when Absalom‘s rebellion failed and his son died, David wept for him. Perhaps David understood that even though Absalom had led the rebellion David had failed him first. How did David fail as a father? He began by collecting wives. As Why did God allow polygamy / bigamy in the Bible? (gotquestions.org) observes, while the Bible does not specifically prohibit polygamy, it make it quite clear God frowns on the practice. In fact Deuteronomy 17:14-20, which lists the principles governing kings, contains a specific prohibition against multiplying wives. David and later his son Solomon violated that principle. 1 Chronicles 3:1-9 and 1 Chronicles 14:1-7 tells us that David had many wives and many children by these wives. As the story of David, Bathsheba, and Uriah illustrates (see 2 Samuel 11-12), because of his lustfulness David sinned greatly. The mere sight of a beautiful woman was enough to cause him to betray a man who had been faithful to him. Instead of loving relationship with a woman, David had a harem, a “marriage” structure too complex for the purpose of raising children. Consider what is too common today. When we divorce and remarry repeatedly, doesn’t that complicate properly raising children? Consider also why King Solomon wrote this proverb (which also appears at Proverbs 25:24). Can you imagine the “joy” of being married to a thousand contentious women? The Bible also hints at David was too indulgent with his children. After Absalom had failed in his rebellion, when David had grown quite old, Adonijah, another son of David, attempted to seize the throne. 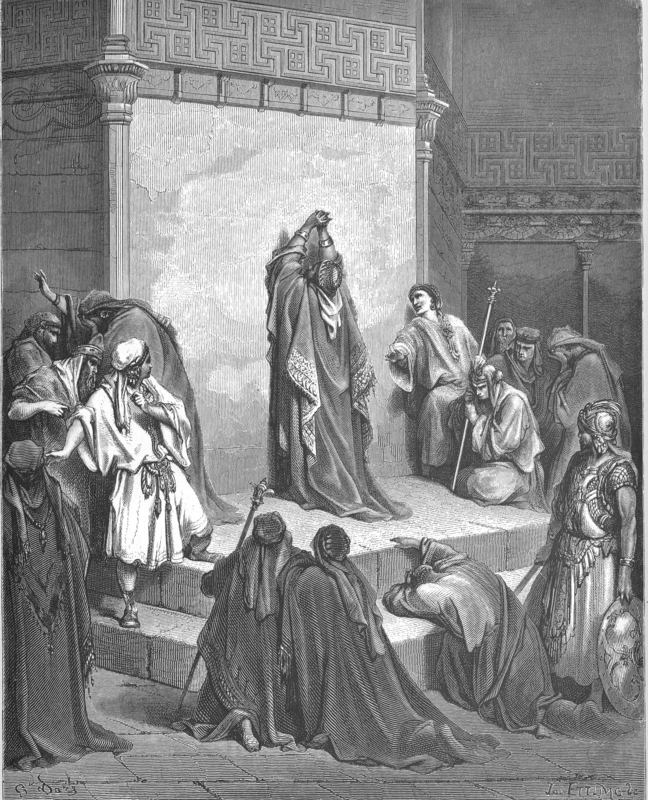 1 Kings 1 tells us how Adonijah failed in his attempt. In the next chapter (1 Kings 2:13-25), the Bible explains why Solomon had his brother executed. How might David have prevented Adonijah’s rebellion? One verse suggests the answer. The Message (1 Kings 1:6) puts it plainly. King David had spoiled Adonijah rotten. So why is King David still considered a hero the Bible? David was a sinful man, but God provided him a way to obtain saving grace. Each time David sinned eventually he admitted his sin, confessed his sin to God, honestly repented, and begged forgiveness. Nevertheless, David suffered for his sins when his sons rebelled. What can we do? We can do what the Bible says. We can instruct our children in Biblical wisdom. We can work with our children. We can seek the help of a good church. We can take control over the education of our children and strive to control our children’s access to the mass media. Will any of this be easy? No. The world and our own sinfulness will seek to thwart our efforts. Therefore, we must each beg our Lord for His help. Great post, Tom! Two or three years ago, I wrote about some of David’s sons and how they were pictures (distorted, to be sure, but pictures all the same) of the Son of David. Though Absalom was not faithful to his father as Jesus was faithful to his Father, what a picture he became–the son of David, dying while hanging from a tree. And the father had to accept the ones who killed his son. J. Great message for father’s day. Too many fathers become involved in other matters and neglect their families and never realize how fast time goes by. David is an interesting soul…one who I reluctantly confess I often identify with. Forgiven but learning how to live with the consequences of the original sinfulness. And as parents, it is paramount that we “instruct” them to the utmost…for to do any less is the opening of Pandora’s box for generations to come. Part of, if not all, of our society’s troubles today. A wantonness that is spreading like wildfire as we’ve allowed a generation to ‘have at it’ on their own without much, if any wise counsel…or it is counsel that comes in hindsight…which leaves a vicious cycle of living with the consequences. I think Jesus described the problem in Matthew 15:1-20. We don’t usually think of the Pharisees as wanton, but the God they worshiped was their own works, not the One in heaven. We are tempted to forget the importance of teaching our children about God. Yet each generation must fear sowing seeds that will bloom into the destruction of the next. We must teach our children that it is all about God, not ourselves. Consider how we look at the Sexual Revolution and the end of school prayer, all that rotten stuff that happened in the 60’s. We say that is when the decline began, but even when the founders were ratifying the Constitution, they were making mistakes. They were setting up practices and supporting ideas that future generations would adopt as their traditions. Some of these would in time replace a command of God with a tradition of man. Instead revering the wisdom of our Maker, we would uphold our own smarts as the gospel truth. To reverse the decline, we must focus upon the Bible and study it carefully. We must ask ourselves; am I obeying God’s command or a tradition of man’s making? Jesus told us to save each other’s souls, not our country. To do that — to become salt and light in this world — we must begin by setting a good example for our own children and grandchildren. thank you always for being the steadfast teacher!!! I’ve always been attracted to David’s story in the Bible as it doesn’t shy away from showing his all too human capacity to sin with the best of them. It provides me hope that God is always willing to forgive and restore us if we are sincere in our repentance and desire to give up control. I had not thought about David’s faults as a father until reading your posted and you are so right, he failed his children in many ways that lasting consequences. Even in a patriarchal society women have great power. It does not long for boy to realize that his mama is just as smart as his dad. In time he figures out that what mama is doing is also important. Pride may drive him to assert that what men do is more important, but time and old age generally brings a bit of humility, if not honesty. By then he has learned to insist that his sons and his grandsons respect their mothers. Otherwise, he is still spending a lot of time on the corner of his housetop. Well done, Tom! David is a great study in our very human failings as parents. His children are kind of a disaster and we can see why. Just the same, King David is a guy after the Lord’s heart. That family structure that God ordained, “as it was in the beginning,” is so healthy and vital to who we are and to the well being of our communities. I recently read a fascinating study on polygamy, how it impacts a culture at large in some very negative ways. One problem is that the wealthy and powerful men start hoarding all the women, so men become envious, unable to build their own little kingdoms. It contributes to increased violence and risk taking, like we see with acts of terrorism or war torn countries.There are actually some politicians in those countries trying to pass laws against polygamy for that very reason. Polygamy is problematic, to say the least. The serial monogamy that many practice in this country is not much of an improvement. Its only virtue is that children are somewhat better off than single women with children. In that case fathers are entirely absent.